Remember when I promised to show you my office? The photo above is a corner of my last office in our old house. But tomorrow I’ll be posting a progress report “after” post of my new office, with the brand new flooring! Yahoo! 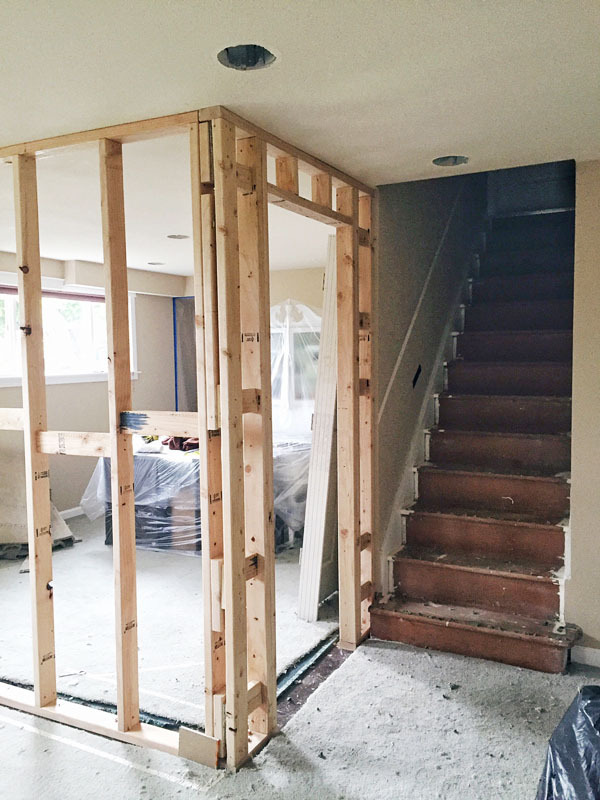 This basement makeover has been a long time coming. As you probably know if you’ve been hanging out here at The Inspired Room for awhile, I run my own business out of my home. So what exactly do I do and what does it have to do with this makeover? In case you are new or haven’t really thought about what I do before, in a nutshell, my business is called The Inspired Room. I am the creator of this blog :) But The Inspired Room isn’t just a blog (although that would be enough as a full time job, ha!). I am also an author of five published books on the home (and have three more in the works and coming up). I write articles for other sites, I create things, decorate rooms and take photos to use on the blog and for other projects. I partner with brands on projects and also lead a fast growing team for our recently launched home and wellness brand called Pure & Lovely. My girls are also very involved in our business so I don’t have to do everything myself. BLESS. We could use about ten more employees to be honest, but my middle daughter has been my only other full time employee of The Inspired Room for the past three years. Employee doesn’t sound like the right word for her; she’s a self-starter, go-getter, and a creative and brilliant leader (as is her sister! ), so I’m grateful to have such great support! Over the years as our business has expanded and dreams started to come to life, we’ve had an ever growing need to make more room for creativity. In our old house, we had a small office plus an adjoining garage we used for our storage and projects. The new hardwood flooring we installed in that office to replace the original carpet really improved the space, and we loved working in there (see that flooring transformation here). Now that we are in our new house, we’ve continued to dream about our future business plans. 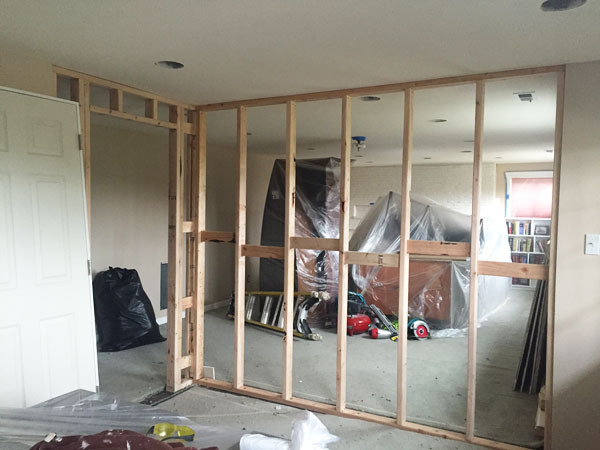 As new ideas came up, we realized we could need more room than we’ve ever had before. We have started to eye more of our lower level as a potential place for our growing “headquarters” :) Our first goal was to create a dedicated office. As you might recall, this space in our basement was previously just a large open room. It was perfect for doing cartwheels but would not be as helpful for my need for quiet productivity (which thankfully doesn’t require gymnastics). The carpet was old and had seen better days. I’m so easily distracted by everything (sounds! smells! sights! squirrels!) that it’s essential to my business and sense of well-being to have peace, quiet and beauty in my world. However, as I’ve shared before, the boys and dogs I share our home with are very loud and cook smelly things all day long (well, the boys do, the dogs don’t know how to cook, unfortunately). They live here, too, so I’m patient but you can imagine how distracting it is for me as an introvert trying to concentrate. That back corner to the left of the stairs (above) seemed like the perfect spot to create a new quieter prettier office space. 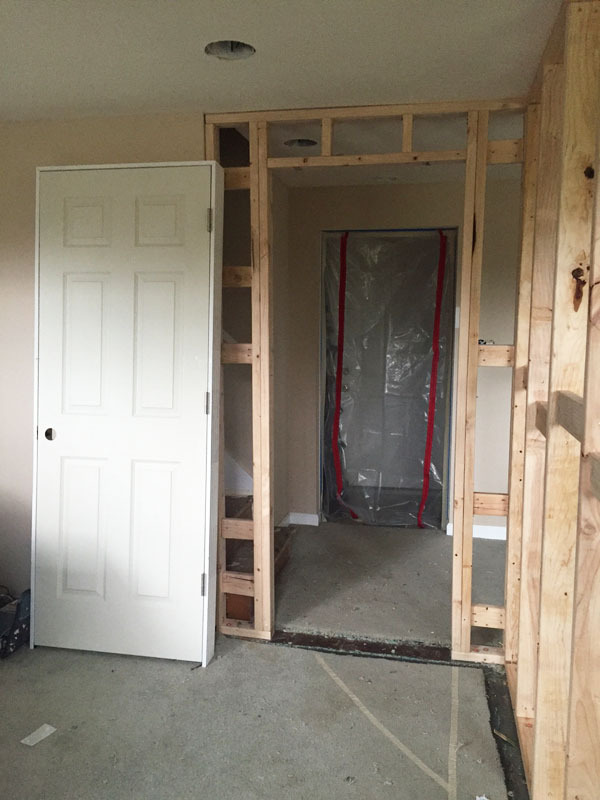 With a couple of walls, a new door and fresh new flooring, we’d be happy as clams. It was such a nice sized room, I was a little worried that walling off a corner of it would make the lower level feel too dark or choppy. As an experiment, we started with some tape to the floor so we could visualize better what each space would feel like. I could tell right away it was going to feel not only natural to have a separate room down here, but it would actually make the whole lower level feel bigger and more useful than it was before. We absolutely LOVED the Mohawk flooring in our previous home, so we were excited to use Mohawk flooring here as well. To complement our style and what seemed to suit our new house and the type of flooring we wanted for our lower level, we selected a beautiful laminate called Concertina in Smokey Chestnut. You might remember the reveal of our new flooring in the family room side of our basement. You can check out the transformation here. 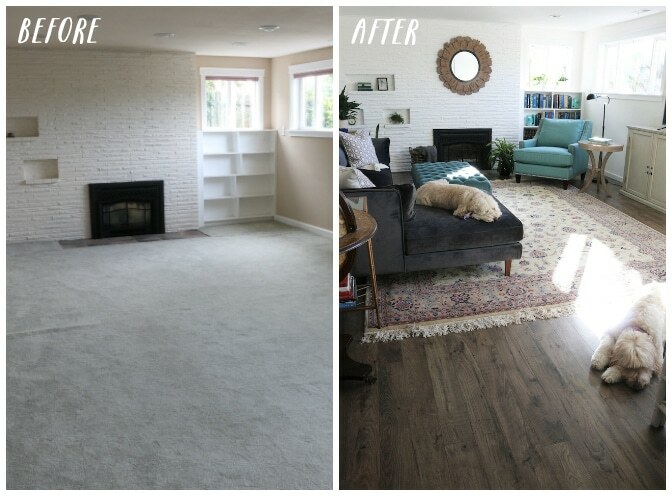 Once we saw how this flooring warmed up our family room and transformed how our entire lower level felt, it got us thinking about how we really wanted to use our space. I think flooring is one of the most transforming aspects of a room. Even if you don’t have any new furniture, flooring makes everything look and feel SO much fresher. I think the right flooring sets the stage and makes it all the more fun to design the rest of the room. It might even have sparked an idea or two for how to reimagine our space, too. Pretty rough progress shots, but it was fun to see the room starting to come together. The flooring was still looking crazy the last time you saw the office, but tomorrow I’ll have a brand new office progress report to share! I can’t wait to show you the after shots of our new office flooring. Plus I’ll give you another hint as to our next steps in expanding our creative space. I agree that new flooring makes a huge difference in a room! We’ve recently replaced a white floor with a dark one in most of the main floor of our home. I find that the new floor makes the space seem cozier. That’s just how I feel about our lower level, it just has a cozier feeling that I love. I’m excited to see the office, Melissa. The floors look wonderful. We have carpet on our lower level, too, and we have decided we will go with a laminate when we change. 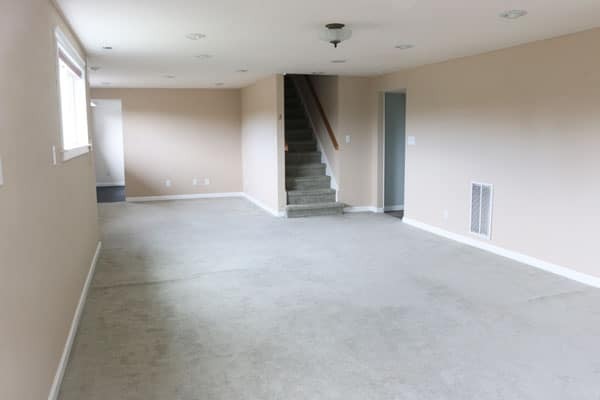 Like you, we also have carpet on our lower stairs. I’m interested to see what you chose for your stairs. You know how, when you see a really stunning design photo, your eyes literally widen? It’s not just me, is it? Anyway, I had one of those moments when I viewed your family room floor’s carpeted “before” + beautiful laminate “after”! Yum! It’s not just you, my eyes do the same thing with a room makeover. 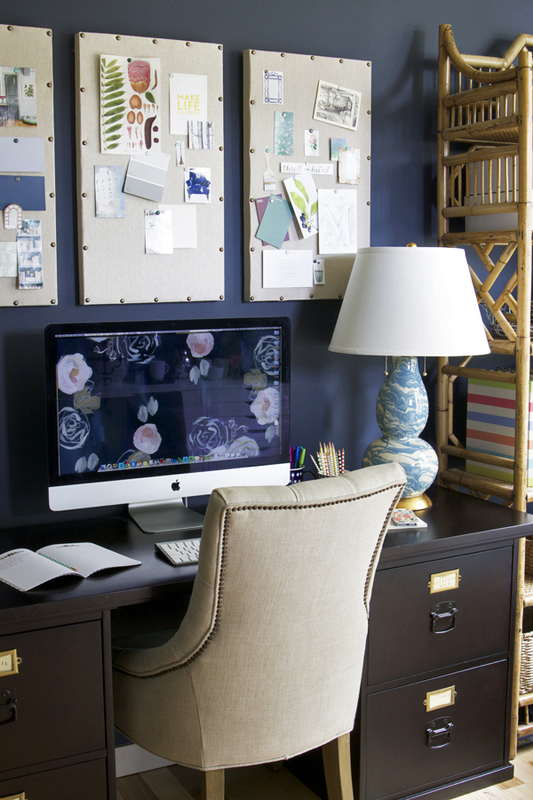 It’s so fun to see how a few changes can make the whole space feel fresh and new! Thanks, Kay! “I’m so easily distracted by everything (sounds! smells! sights! squirrels! )” Melissa, I could easily have written those same words. Oh, my goodness… we are kindred spirits. ;) Your downstairs living area is so delightful and cozy and I could imagine myself snuggling in there with my laptop to write… only to be distracted by the pretty furnishings, etc. LOL I look forward to seeing your new office and can already imagine how lovely it will be. Your previous one was a treat for the eye for sure! Have a blessed day, my friend! Kindreds, for sure! It’s been fun to see the new flooring and walls for the office (which I’ll show tomorrow!). I’m still thinking through the next steps downstairs, but it’s always fun to celebrate and appreciate progress! Thanks for following along, Diane! I am eagerly awaiting to see the office, Melissa .This looks great. I too need quiet atmosphere and beauty around to work in peace.But have to do whatever way I can.Great post . we have been in our new home a couple of weeks but praise God it already has lovely wood floors and neutral carpeting! our last home of 16 years never did get the new tile flooring we promised ourselves when we moved in. 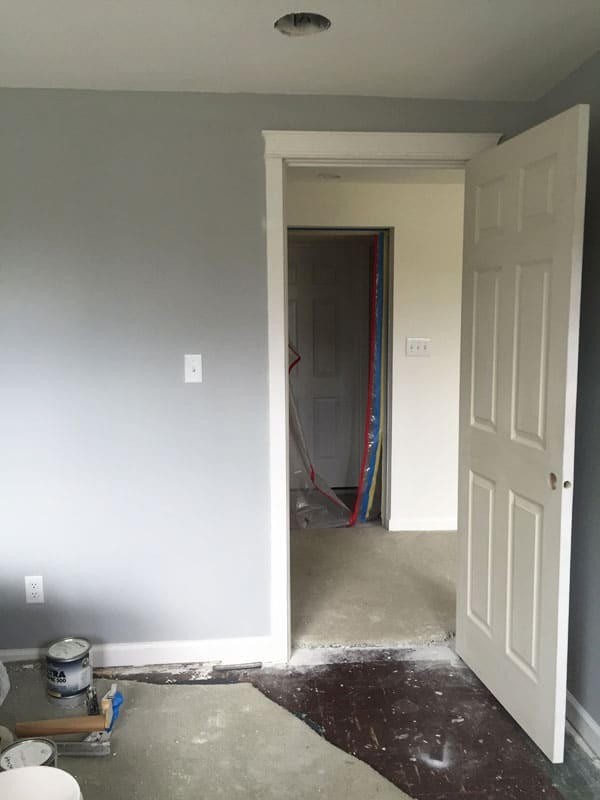 we run our business from home and are in process of organizing and setting it up in one of the extra bedrooms so I look forward to what you have done. being an introvert, I too need quiet and solitude to accomplish things and seems there is always someone, ahem, being noisy around me. extroverts and introverts living together, God’s sense of humor I guess. :-D yes, ha! 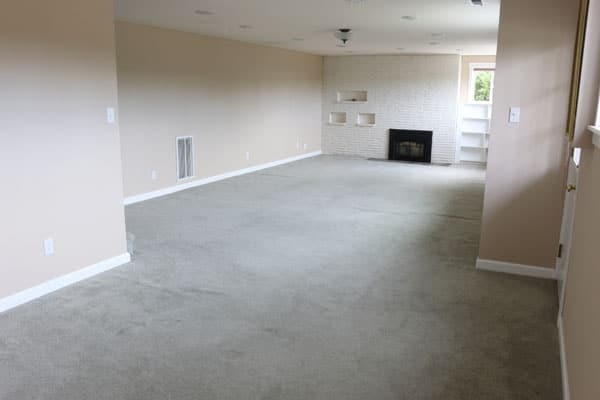 You’ll be happy to have that space! It makes such a difference. Congrats on your new home! Can’t wait for tomorrow’s reveal of your office! Actually, since the kitchen reveal (which is so cute and cozy) I forgot about the office. See you tomorrow! I love the way your family room space looks now with the laminate flooring. Excited to see your office and hear your future plans, too! Brilliant. Love the use of space effectively and creatively. It is amazing how just changing the flooring can make a room look much larger than it earlier seemed. 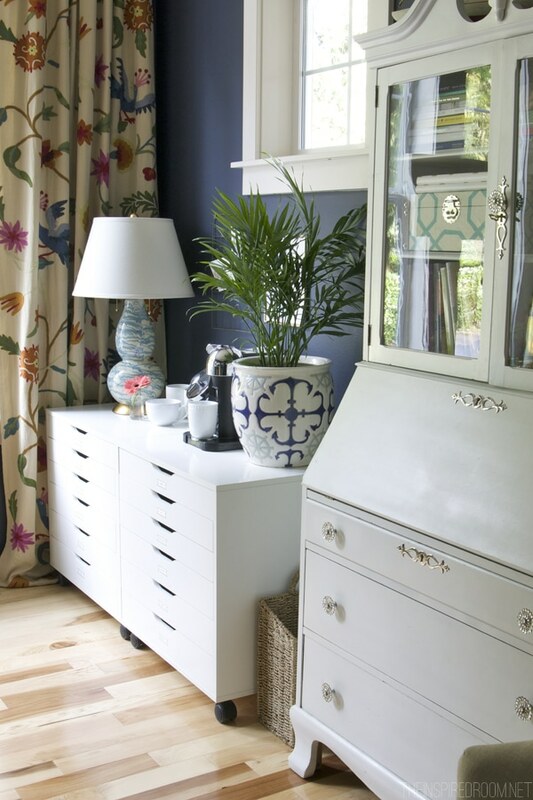 And add light furniture, rather than heavy pieces and you create an airy, bright and inspiring space. Ok, super specific question for you because I’ve had issues in the past with similar furniture – How were the wheels on that white corner desk/chest in the old office? Did they lock? If they did, how did you keep them from scratching the floor? My wheely desk similar to that always ends up bumping the wall if the dog looks at it wrong, and we’ve been told that locking wheels just slide and scratch on wood floors. Was anything like that ever an issue for you? This looks amazing! I love the bluish/dark gray couch…where is this from?